This webpage (no longer available, image available here) is the flag of the Partit Nazzjonalista (Nationalist Party) of Malta. It consists of the Malta coat-of-arms on a dark blue field and the letters 'P' and 'N' in the third and fourth corners respectively. An emblem or logo of the PN is also at http://www.naxxar.com/mt/assocjazzjonijiet.shtml. The Nationalist Party was established in 1880 by Fortunato Mizzi as an opposition against British rule as a liberal party. This caused tensions with the Roman Catholic Church. In its early years the party was split up into “abstentionists” and “anti-abstentionists”. The latter didn’t occupy their seats in parliament as a sign of protest. After WWI the Maltese Political Union (UPM) came into being. Its pro-Italian wing seceded, giving itself the name Democratic National Party (PDN). Both wings took part of the elections of 1921 (only one of both wings per region) and 1923 (both wings everywhere). In 1923 they built a coalition. In 1926 both wings had been reunited taking the original name again. In 1927 PN lost the elections against a coalition of MLP and the Constitutional Party(PC). Quarrels between the church and the PC pushed the country into crisis in 1930. The next elections in 1932 were won by PN triumphantly, supported massively by the church. A little later government and constitution however were sacked by British government, caused by close relationships between Mussolini and the PN and PC. Though being under heavy pressure by British government (leaders were detained and brought to Uganda) and forbidden to take part of elections in 1945 the party survived after WWII. It is a black flag with a yellow bordure. In the centre of the flag is a shield divided per fess into white and red. The shield is flanked at the bottom by yellow, dotted capitals “P.” and “N.” and topped by a yellow coronet with blue interior. I have found a number of photographs of the flag of the PN (Partit Nazzjonalista / Nationalist Party). From these I have made a few drawings of flags and flag variants. Also found: the same as above, but a wide blue border added all around. And the same as above, but with a narrow outer border of yellow, and a wider inner border of blue, all around. For larger rallies there are obviously a few home-made square variants of the party flag, that include (in various combinations) the party flag, the EU flag and the national flag. All of these seem to be single examples. I have reconstructed four of them from photographs; as far as I can see, there might be others. This flag is square, divided in nine equal fields: upper row PN, PN, PN; middle row PN, Malta, EU; lower row PN, PN, PN. All the flag components are square as well, and the stars of the EU flag are not oriented in the correct way. This flag is square, divided in nine equal fields, alternating PN and EU. This flag is square, divided in four equal fields: upper row Malta, EU; lower row EU, PN; all around a wide golden border. This is a more complicated flag: it is square, (medium) blue with a wide golden border; the blue field is divided in nine equal fields, of which only three are showing symbols, the others are plain blue: in the upper row to the hoist white with a green cross throughout; in the middle row in the center the PN flag; in the lower row to the fly the EU flag. In the lower hoist corner and the upper fly corner of the whole flag there are two piles per bend counterchanged. 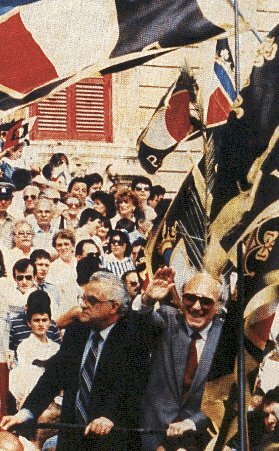 There are two flags that are used for supporting the PN leader and current Maltese prime minister, Lawrence Gonzi. Both show the logo of his campaign: in the center the inscription "gonzi" and "pn", below a slice of the national flag, and above the motto "iva, flimkien kollox possibbli" (yes, together everything is possible). The main version is a plain white flag with the campaign logo as described above. Another, but rare version shows the campaign logo (minus the national flag slice) on the whole national flag.